Relaxing here in a clearing, sipping world-class local wine as the sun sets over the blue sea below, I find it hard to believe our luck. We have just bought the forest that stretches for acres all around, but if we need some milk in the morning, we can drive down to the local town in fifteen minutes or, if the mood takes us, we can be at the international airport within the hour. Our little piece of paradise is in Tasmania, a state that remains largely neglected by tourists and by mainland Australians alike, and yet the lush 68,000 square kilometre island contains some of the most productive land in the southern hemisphere. While the rest of Australia suffers under fifty years of drought, Tasmania not only supplies much of the country’s soft fruit, but also supports a burgeoning and very successful boutique wine industry. The state largely escaped the Australian property boom and subsequent crash of 2002, and, compared to the rest of the country, land in Tasmania remains cheap and undeveloped. It is true that in recent years, the part of the island closest to the cosmopolitan buzz of mainland Melbourne has undergone something of a metamorphosis, with affluent mainlanders buying up waterside frontage, or giving up their office jobs to start boutique vineyard farm-stays. Later entrepreneurs have since spread out along the coast, with locals scrambling to subdivide and to sell them their previously worthless land. It is away from these northern areas that today’s bargains are to be found. 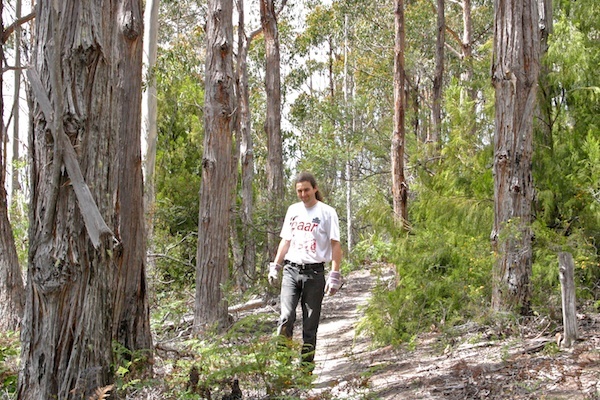 A year ago, there was still land available on the hills above the capital city of Hobart. Today you should point your car southward, and in only half an hour you will find yourself in the Huon Valley wine region, currently densely thicketed with ‘For Sale’ signs. The larger tracts have been given over to viticulture, but what remains are little pockets of bush, perhaps hard-won fifty years ago, but now often willed to disinterested children who really just want to sell up, split the money, and get back to the city. Logging is a part of life here, and apart from some rather spectacular National Reserves, there is little standing timber over fifty years old. A typical ‘bush lot’ comprises up to twenty acres of young gum trees for up to $100,000, a price that could also get you a mere handful of acres of cleared building land with water views. Having done most of our research on Tasmanian Private Realty‘s excellent website, we only needed a single weekend to view our shortlist before settling on fourteen acres sloping gently down towards the sea. Cygnet is the closest town. It is typical of the area in that it comprises a simple line of a few homes, some local businesses, and three pubs. When we spoke to the new owners of the Top Pub where we were staying, we found that they were renovating the upstairs into a boutique hotel. The nearby Red Velvet Lounge restaurant offered a gourmet menu featuring locally farmed salmon and organic produce, and there was talk of a new deep-water marina close by. These are not the hallmarks of your average bush town, and so it seemed to us that now was the time to buy. We intend to build a small home in a clearing, but could equally well put up a series of guest lodges. That’s all in the future, though. For the moment, we are content to sit and sip our wine and enjoy the views. 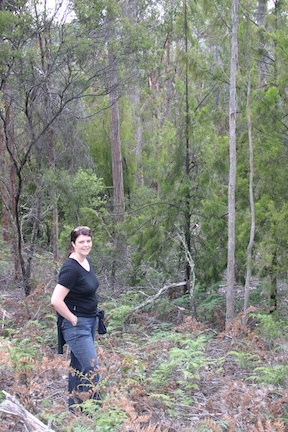 This entry was posted in A Forest in Tasmania, Australia, Travel on 2007/10/28 by Reinhard.